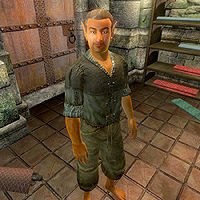 Gelephor is a Bosmer commoner working as the watchman at the Imperial City's warehouse in the Market District. He is also a Skooma addict and takes occasional trips to the infamous Skooma Den in Bravil. He is very much a loner and spends the majority of his time inside the locked warehouse, always prepared to kick unwanted visitors out the door. He sleeps on the top floor of the warehouse every night between midnight and 6am. After waking up, he heads downstairs to the ground floor and spends all morning wandering around amidst the many shelves and wares. He leaves at noon for a quick, two-hour lunch at the neighboring tavern, The Feed Bag. He returns to his duties at 2pm and keeps doing them until his bedtime at midnight. On the 17th of each month, after weeks of abstention, his Skooma urges takes precedence and he packs up and leaves the warehouse at midnight. He crosses the Talos Bridge before heading southeast on the Red Ring Road, passing the Ayleid ruins Fanacasecul and Vindasel on the way. At the crossroads near Pell's Gate, he heads south on the Green Road until he finally reaches Bravil after nearly fourteen hours of traveling. Once there, he heads directly for the Skooma Den and spends the next two days downing Skooma with the similar minded residents, without ever eating or sleeping. When the clock strikes midnight on the 19th, he leaves the Den and begins his long journey back to the big city and the warehouse. His weapon of choice against potential thieves, or the wildlife along the Green Road, is an iron mace. He is clad in lower-class clothing suitable for a Skooma addict, a burlap vest and sack cloth pants. He carries a pair of leather boots and a leather helmet, both of which he will equip during his trip to Bravil. He also carries the key to the warehouse and the mug he uses for Skooma, as well as a small amount of gold. When approached, he will be brief and to the point: "I'm Gelephor, the watchman. I keep an eye on things." When asked about the Imperial City, he will be more talkative: "Crime in the City? You hear a lot of complaining, but it's really not so bad. The Thieves Guild is smart; they don't want any trouble with the Watch." If you don't unlock the Skooma Den, then Gelephor will never return to the Imperial City. This is because the door can only be opened by those in the Bravil Skooma Den faction, and he is not. Since he cannot use the door, Gelephor will always be found outside the Den drinking Skooma with fellow addict Trenus Duronius. This bug is fixed by version 3.3.0 of the Unofficial Oblivion Patch. You can add him to the faction through the console, and he will then be able to enter the door and subsequently return to the Imperial City. This page was last modified on 17 August 2018, at 12:53.